Checking the mail is like Christmas morning around here lately! 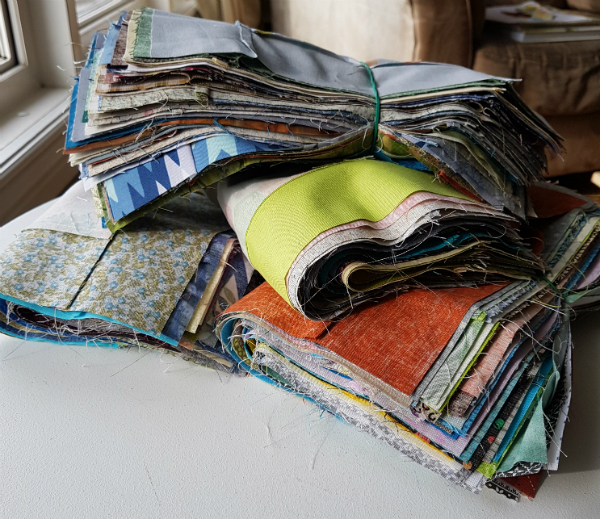 Blocks have started rolling in for the quilts for the seniors displaced by the fire a couple of weeks ago, along with battings and fabric for backing and binding. This incredible stack of 301 blocks all arrived on one day! This gorgeous quilt top arrived the same day. 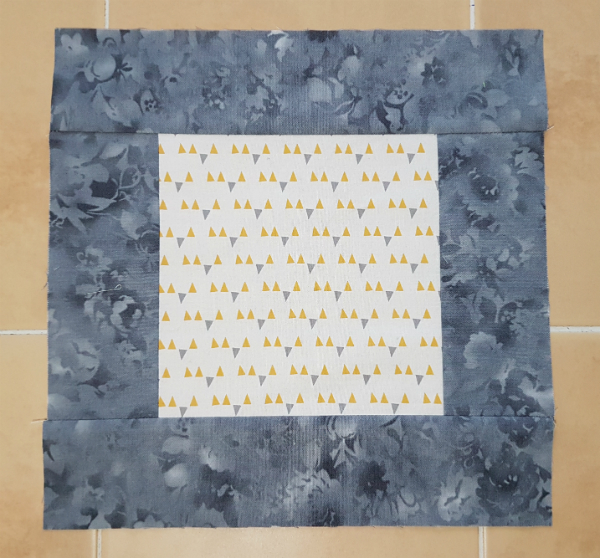 I've started grouping blocks together to make tops. 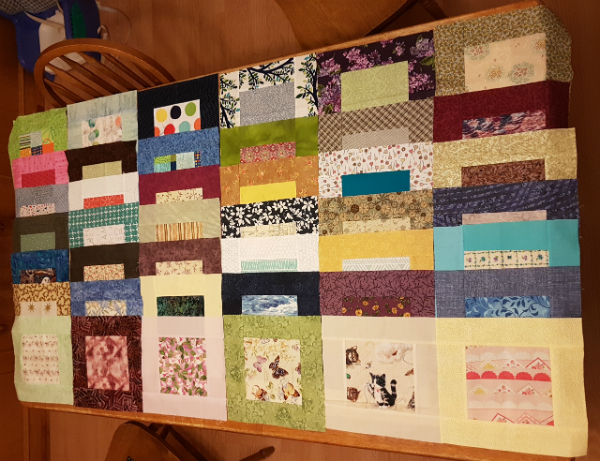 42 blocks per quilt, in a 6x7 layout that just fits on my kitchen table if I overlap the blocks. I'm trying not to stress too much over this part of the process. 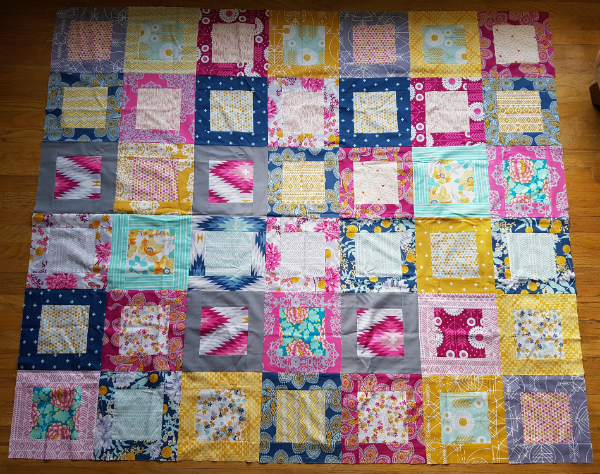 We all know it would be possible to spend an hour or more rearranging and switching out blocks for each quilt, but I don't want to spend that much time on each one. The goal is a pleasing scrappy arrangement, not a perfect one! 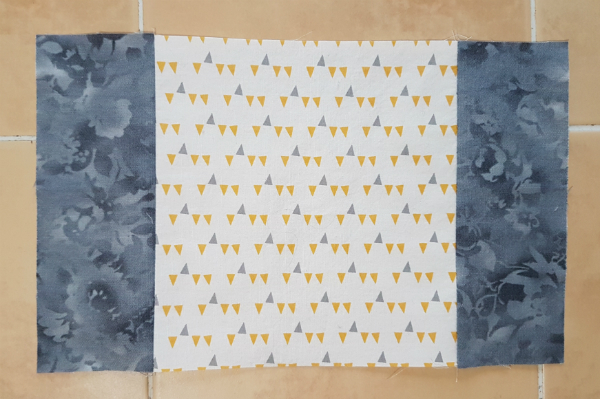 I'm really enjoying looking closely at each of the blocks and especially enjoying when I come across a fabric that I have in my own stash. And I'm finding plenty of fabrics I wish were in my stash! It's also fun to see the eclectic mix of traditional and modern prints, novelty prints, batiks, reproduction prints...you name it, I probably have some of it in these blocks! I will have help sewing the tops together (thankfully!) so for now I'm just creating bundles of 42. That way I can either give them to someone to take home and sew or I can take them to the sew-day I'm planning to have at our church in May. I know of a young mom-to-be who has "cervical problems," as it was described to me. That, of course, means there is the potential of complications to the pregnancy. Since hearing about this, mom-to-be and baby have been weighing heavily on my mind. Sometimes I pray what I would consider a "proper" prayer for them, a prayer where I am focused on talking to God and I pray in full sentences that make sense. It's the kind of prayer that could be considered part of a conversation. Other times mom-to-be pops into my head while I'm in the midst of something and my prayer sounds more like "Please, God." No context, no complete sentences, nothing more than the vaguest of requests. But God knows exactly what I'm thinking and what I'm asking for. Psalm 139 says, "You have searched me, Lord, and you know me. You know when I sit and when I rise; you perceive my thoughts from afar. You discern my going out and my lying down; you are familiar with all my ways. Before a word is on my tongue you, Lord, know it completely" (Psalm 139:1-4). I find it comforting to know that God knows what I mean when all I have time for is one or two words in prayer, don't you? 1 Thessalonians 5:16-18 says, "Rejoice always, pray continually, give thanks in all circumstances; for this is God’s will for you in Christ Jesus." Other versions say "pray without ceasing." On the other hand, Paul wrote in 2 Thessalonians that one of his guiding philosophies was "The one who is unwilling to work shall not eat" (2 Thessalonians 3:10). Nowhere in the Bible are we told that we are to do nothing by pray. We are to be working hard, serving God and others, earning the food we eat, even while we are also praying continually. You would think the two are contradictory, but they are not. 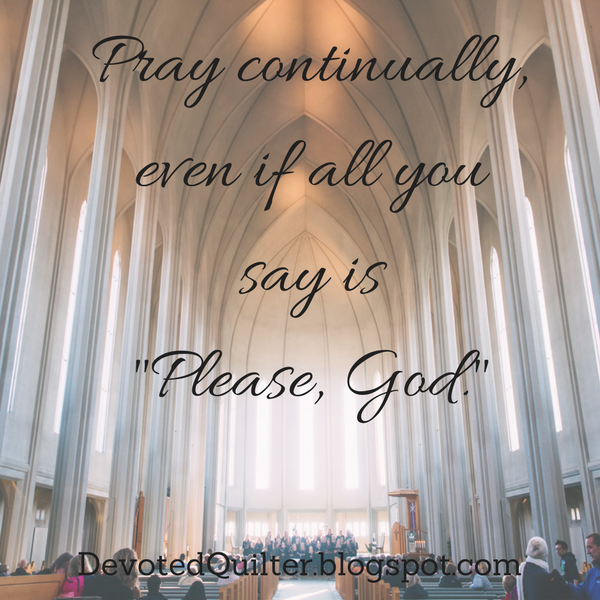 In fact, I think my "Please, God" prayers are exactly what He means when He tells us to pray continually. Not that we need big, long "proper" prayers all the time, but that prayer is a natural extension of our everyday thoughts. Praying continually means that when something pops into my head I can pray about it then and there, no matter what else I'm doing, or where I am or who else is around. No matter how brief my thoughts might be, God is always there and always paying attention, ready to listen and understanding exactly what I am thinking. There is definitely a time for proper prayers. Definitely a time for sitting and spending time with God while not in the midst of doing anything else. But praying continually opens my mind to the fact that God is always with me. Praying continually means the lines of communication are always open, even when I have work to do. How many times have I done this? I'm barely even finished congratulating the person telling me their news and already I'm trying to decide which quilt pattern will best fit the situation. Or I'm wondering if I should design something especially for them. Or I know exactly what quilt to make, but I'm planning out possible colour combinations. My mother-in-law watched me fold a load of laundry a few months ago and commented that she would iron all of those T-shirts before she put them away. I just laughed. Iron clothes? That doesn't happen around here unless someone is going to wear the clothes that day. I'm certainly not ironing anything that's being put away before being worn. 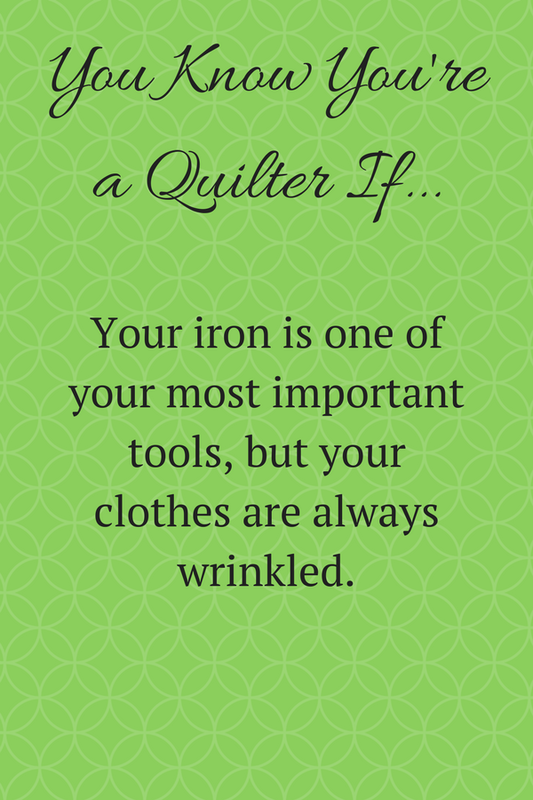 And yet my iron is in such heavy use that it stays out on the counter all the time, lol. This was me on our recent trip, except I had left my phone at the hotel so I actually made Paul take the picture 😊 I couldn't let the opportunity pass by, it was a great hexagon design! 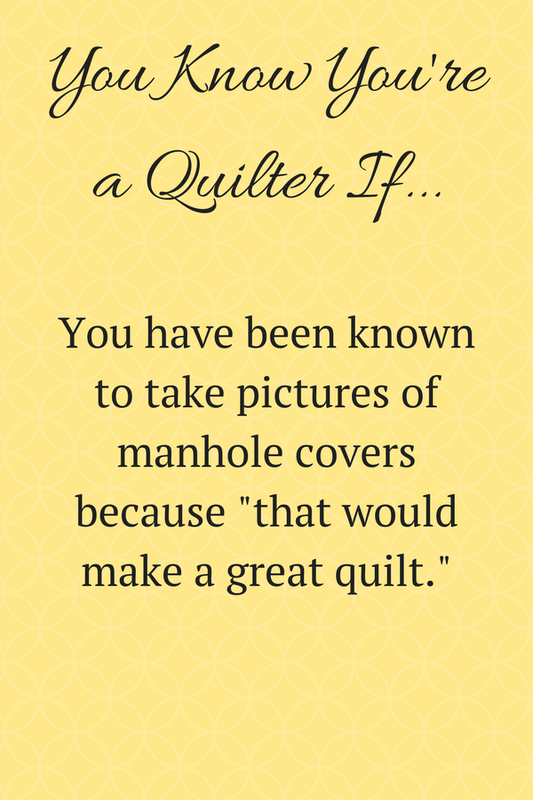 Which reminds me, I should probably get him to give me the picture...Oh, and my X Marks the Spot mini quilt pattern was inspired by a manhole cover. You can see the picture I took of it in this post. Even just a day out of town means I have to stock my Sew Together bag for EPP, since any trip out of town requires quite a bit of driving time. And I always take way more than I need, because I really wouldn't want to run out of things to work on! 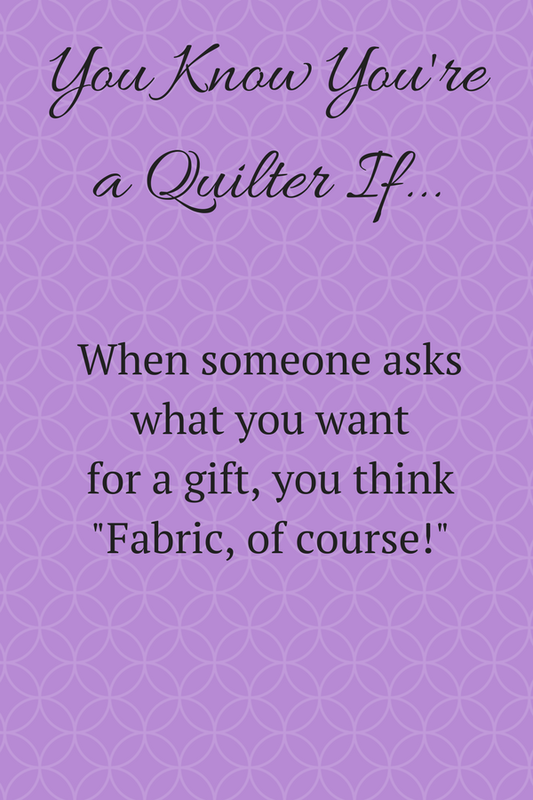 Those are my 5 ways to know you're a quilter, but what did I miss? 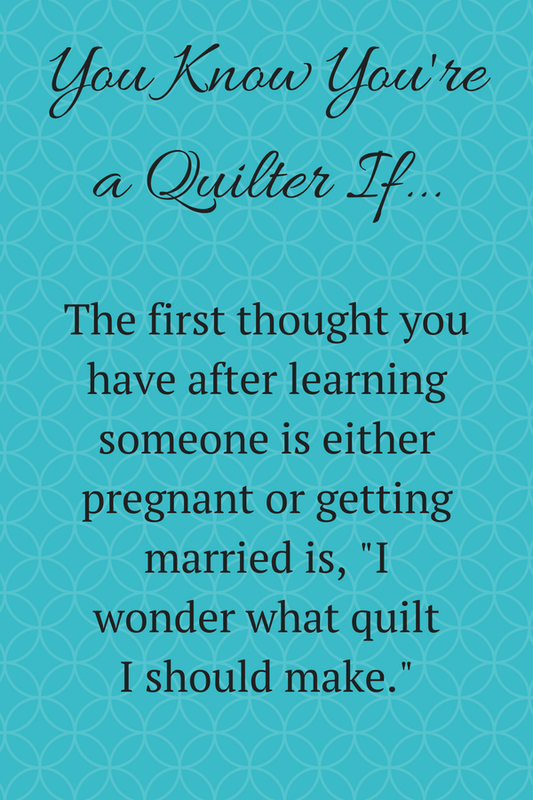 How would you finish the sentence "You know you're a quilter if..."? Happy Easter! I hope you had a beautiful Easter weekend, complete with chocolate 😊 Here in Newfoundland, our spring break is always the week following Easter, so it's great to be able to relax a bit this week. 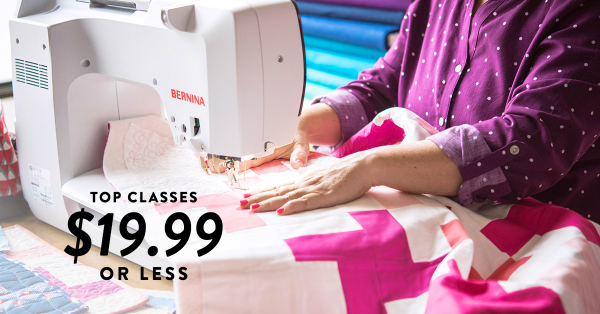 There will hopefully be an abundance of sewing happening too! It's obvious to me that none of these people actually expected Jesus to be able to get Himself down off the cross and avoid death. Instead, they all fully believed that He couldn't, and when He didn't save Himself it simply served as further proof to them that He wasn't anyone special. After all, why would the Son of God, the Messiah, allow Himself to be treated so cruelly? Why would the Son of God, the Messiah, allow Himself to be killed? Wouldn't that just destroy whatever plans He had for saving Israel? They completely misunderstood what was happening that day, even those who had worked so hard to make it happen. 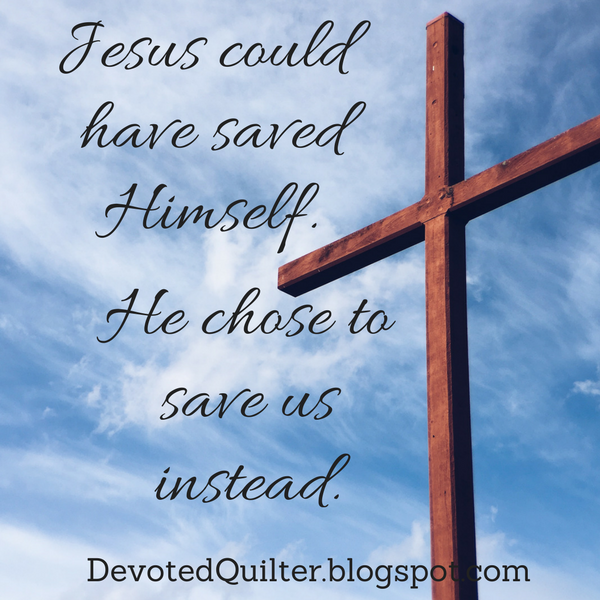 Jesus didn't want to save Himself. Yes, He probably desperately wanted the pain to stop, but He had in fact chosen the cross. He had chosen to suffer and die. Everything was going according to plan and saving Himself would have defeated His purpose. You see, He didn't want to save Himself because He was in the process of saving you and me and all of those who would ever believe in Him as Savior. He couldn't save us if He saved Himself. The writer of the book of Hebrews wrote, "For the joy set before him he endured the cross, scorning its shame, and sat down at the right hand of the throne of God" (Hebrews 12:2). What was the joy set before Him that allowed Him to endure the cross? We were. Isn't that an amazing thought? Our salvation, an eternity with us, that was the joy that He anticipated that gave Him the strength to endure the pain of the cross. Saving Himself from the pain of the cross and the pain of death would have put a stop to His suffering for a time. But saving us from the slavery of sin put a stop to our separation from God for all eternity. Jesus could have saved Himself. He chose to save us instead. **Edited - Quilters are amazing!! I cannot even express how blown away I have been by the response to this request for blocks. I have had so many blocks offered already that I have to stop accepting new offers. I can't believe I'm saying that after only a couple of days 😊 If you have already offered blocks, please do make and send them, but if this is your first time seeing this request, then I don't need more offers of blocks. I am still accepting offers of batting and backing, though, so you could contribute those if you want/are able to. I can't wait to see what my mail is going to look like for the next few weeks! If you follow me on Instagram you may have seen my pictures last week of the senior's home across the road from us that caught fire. Thankfully the fire started while the residents were having supper so they were all in the dining room, which made the evacuation very quick and simple. Unfortunately, the fire completely destroyed the home. All of the 21 residents have now either been placed in other care facilities or they are staying with family for a while. Because of the fire they have lost all of their belongings. 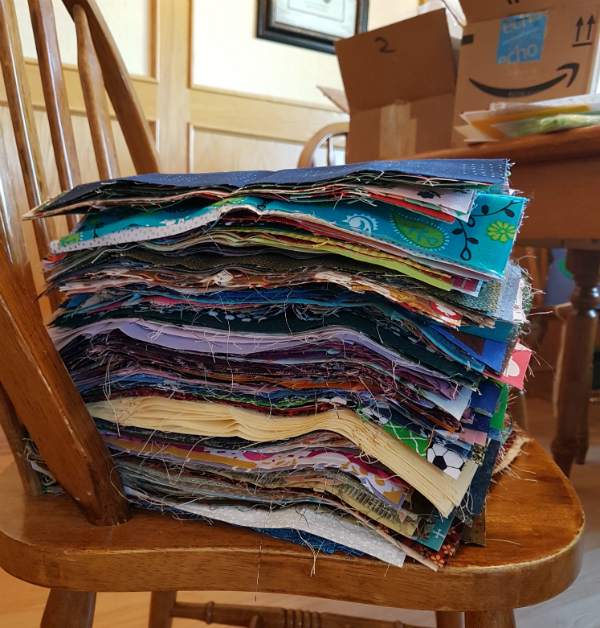 Thanks to a suggestion from Laura (Slice of Pi Quilts) I have decided to organize a block drive to make a quilt for each of the residents. I've never done anything like this before, so I'm a little nervous about how it will all go, but I'm trusting in the love and generosity of the quilting community to help me make this work 😊 After talking with one of the women in charge of the home, my aim is to make a 60" x 70" throw for each person. 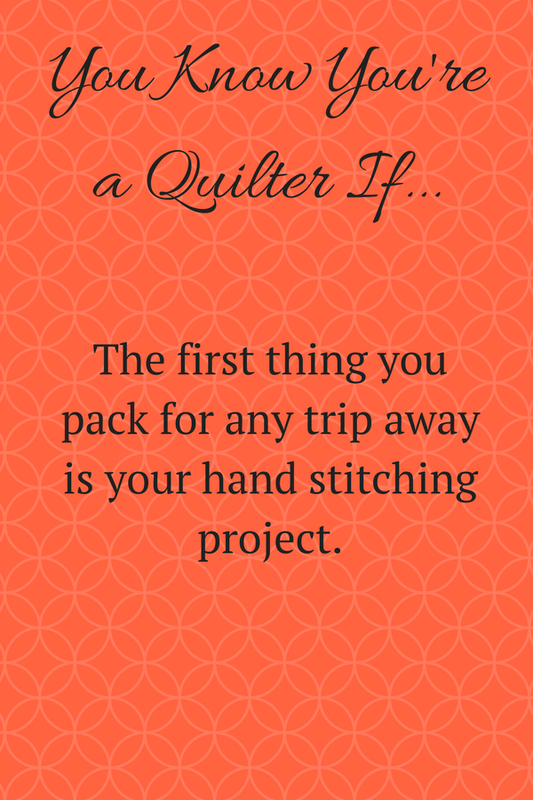 Each quilt will require 42 blocks, which makes for a total of 882 blocks needed. Blocks can be made in any colour combination. We will also be needing donations of batting and backing (70" x 80" for both) as well as fabric for binding (1/2 yard for each quilt or 10 1/2 yards total). 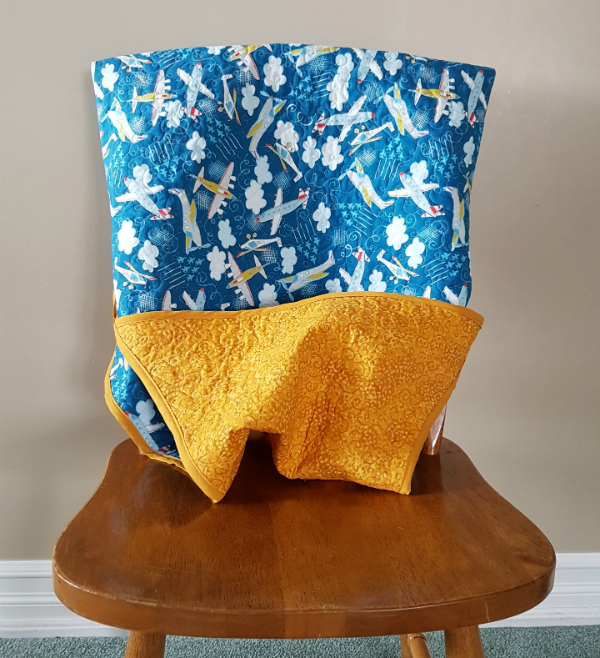 Also, any Newfoundlanders reading who own a longarm and would be willing to help with the quilting, please let me know! 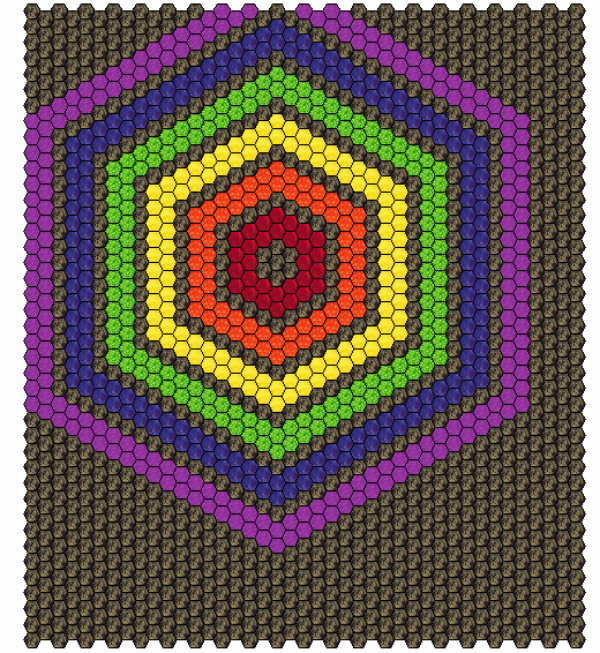 In an attempt to keep things simple, I'm asking for a simple bordered square block, finishing at 10". 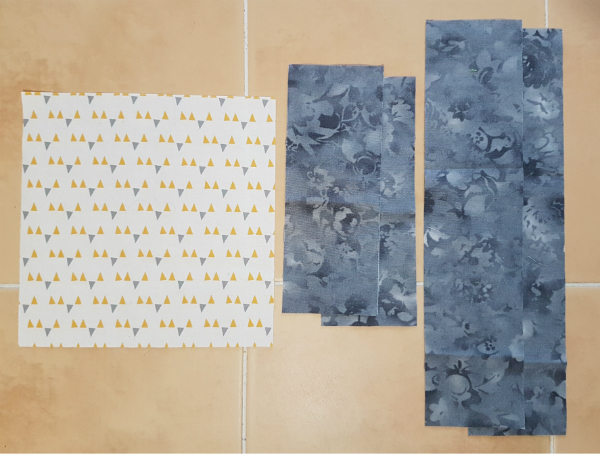 Choosing fabrics with good contrast will make for the best blocks. Of the residents living in the home 6 were men, so we definitely need some masculine-looking blocks. From fabric 1 - 1 square 6 1/2" x 6 1/2"
From fabric 2 - 2 rectangles 2 1/2" x 6 1/2"
- 2 rectangles 2 1/2" x 10 1/2"
* Edited - Some people have asked if it would be okay to use a 5" square for the middle...that will be fine, as long as the finished square is 10 1/2". 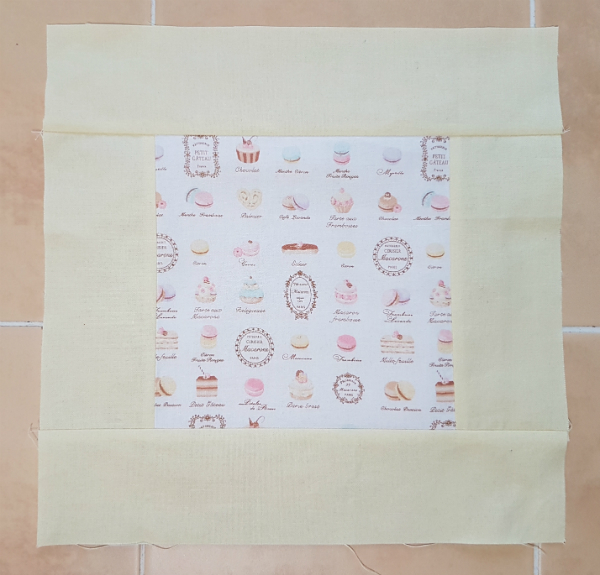 Add a 2 1/2" x 6 1/2" piece to both sides of the 6 1/2" square. Then add the remaining 2 1/2" x 10 1/2" pieces to the top and bottom. And that's it! Easy, right? I don't know why I've never made a quilt from this block before, but I'm really looking forward to seeing how all of these quilts will turn out. Here's the second block I made. The colour is a little off in this picture for some reason...that solid fabric is actually a lovely soft yellow. Thank you so much for helping me bring a little comfort and love to these 21 people! 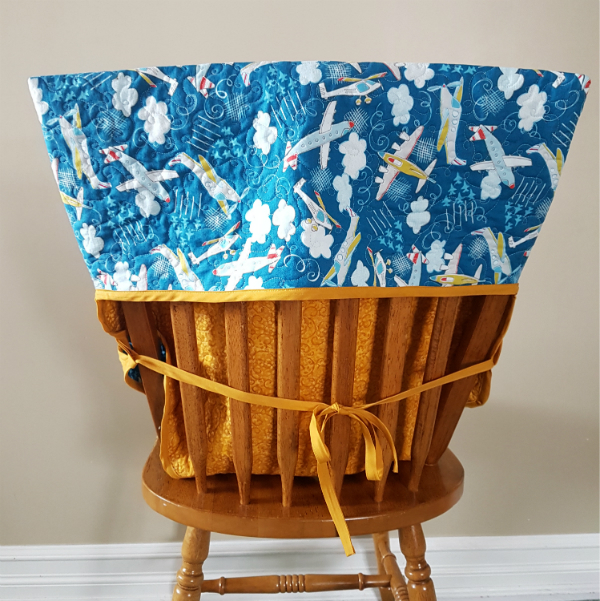 This is now my third time making this genius roll-up baby chair from Canadian Living magazine. You can see Judah's version, but apparently I never blogged about Isaac's version. The recipient of this latest seat hasn't been born yet, so it's for 'Baby Kirby' for now. 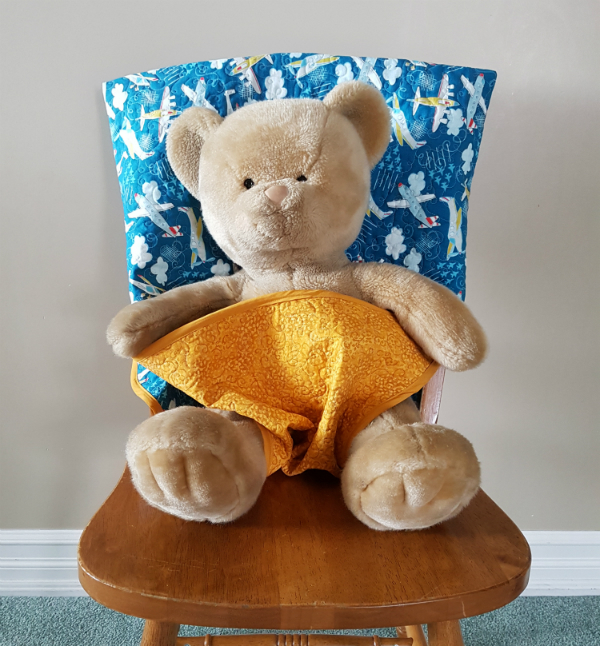 The only change I make to the pattern is to add 3" to the top because I found Judah's seat was just a bit too short for some chairs. With the added length I'm fairly certain this seat will fit on almost any dining room chair. It is one of the most brilliant things I've ever come across and it's simple to make, which is a real bonus. How many times do parents go somewhere with baby and there's nowhere for baby to sit at the table so you end up holding the baby the whole time? Now, with this seat stashed in the diaper bag, it's easy to give baby his own seat and make everyone happy! Here's what it looks like from the back of the chair. And here it is all opened up. 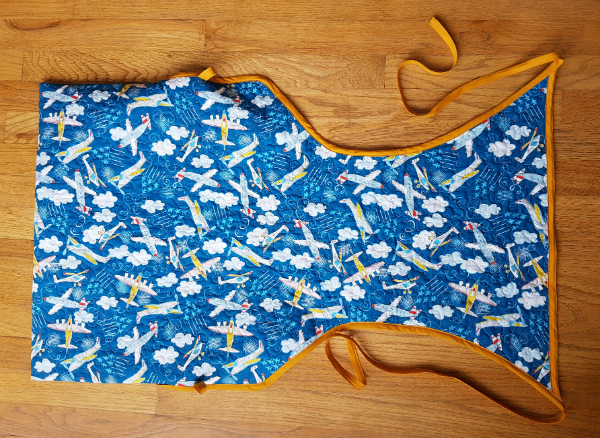 The plane fabric is just too cute, isn't it? It's from Camelot Fabrics and it's called "Take Flight." 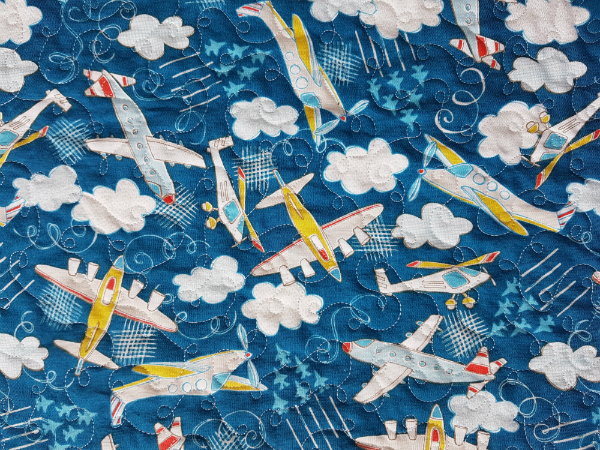 I just had to do a loopy-stipple quilting to go along with the smoke trails behind the planes. 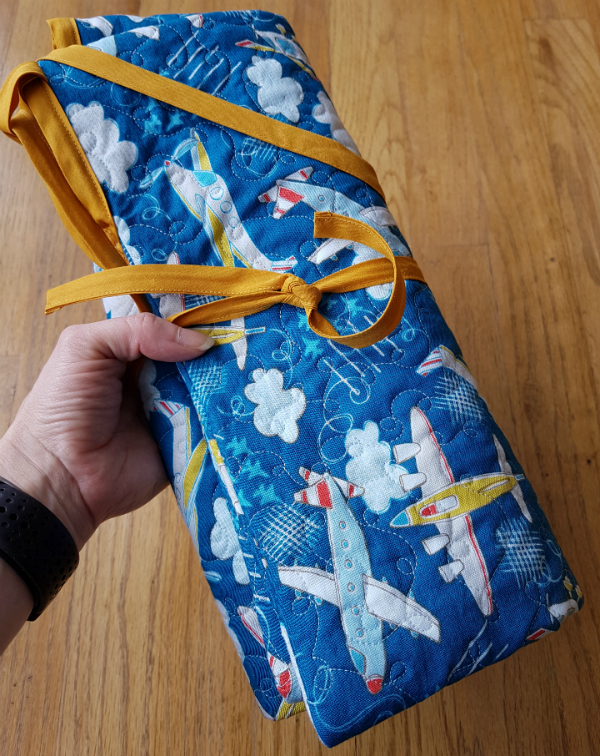 The seat folds up really small and the bias tape ties can even keep it all tied together. How I wish I had one of these when my boys were small! Next best thing, I'll just keep giving baby seats as shower gifts 😊 What is your go-to baby gift? When Paul and I came back from our trip to the States, we had to go through Canadian customs in the Toronto airport. Looking at the other people in the line, I noticed that together we represented a bunch of different ethnicities and backgrounds. Despite how different we all looked, though, there was no question about any of us being allowed into Canada because we were all carrying Canadian passports. That little government-issued document identified all of us as being welcome to enter this country because we belong here. Paul checked his bag multiple times before we left to be sure we had the passports because without them we wouldn't get out of Canada or get back in. Those documents are the proof of our identity and we absolutely had to have them. I am a Canadian citizen by birth, but that only accounts for my physical citizenship. According to Philippians 3:20, my spiritual citizenship is a different matter. Paul wrote, "But our citizenship is in heaven." He also wrote, "For he has rescued us from the dominion of darkness and brought us into the kingdom of the Son he loves, in whom we have redemption, the forgiveness of sins" (Colossians 1:13,14). Our physical citizenship is important, obviously, but it has nothing to do with allowing us into heaven. God will never look at whether we were Canadian or American or Australian or Indian or whatever. When it comes to gaining entry into eternal life with Him, only our spiritual citizenship will matter. My Canadian citizenship was automatically given to me at birth. Our heavenly citizenship was also given to us automatically, at the moment of our spiritual birth into the family of God. As soon as we believed in Jesus as our Savior, we became citizens of heaven, welcome to enter God's 'country' because we belong there. Isn't that a beautiful thought? We even have a passport to show our citizenship! "And you also were included in Christ when you heard the message of truth, the gospel of your salvation. When you believed, you were marked in him with a seal, the promised Holy Spirit, who is a deposit guaranteeing our inheritance until the redemption of those who are God’s possession—to the praise of his glory" (Ephesians 1:13,14). 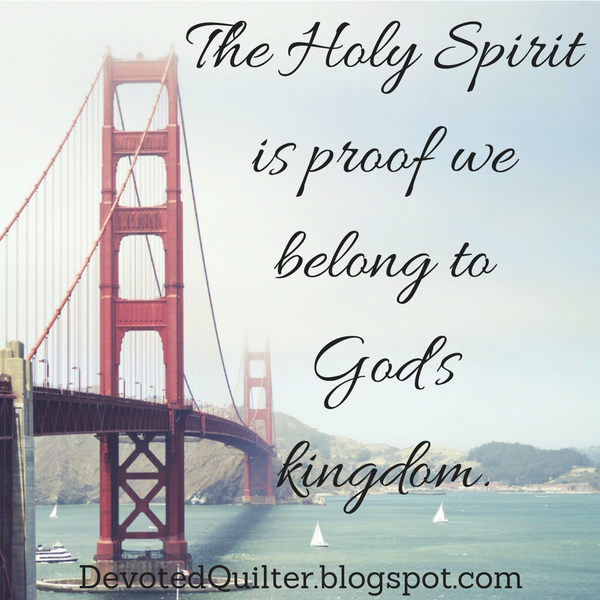 Our heavenly passport is not a document, but the Holy Spirit living in us is proof that we belong to God's kingdom. It doesn't matter what we look like, where we came from or how different our backgrounds may be, if we have the Holy Spirit then we will be welcome into heaven. In fact, the Bible tells us specifically that all of the nations of the world will be represented in heaven: "After this I looked, and there before me was a great multitude that no one could count, from every nation, tribe, people and language, standing before the throne and before the Lamb. They were wearing white robes and were holding palm branches in their hands. And they cried out in a loud voice: “Salvation belongs to our God, who sits on the throne, and to the Lamb" (Revelation 7:9,10). We'll have come from everywhere, but on that day we'll all be carrying the same passport and praising the same Lord. If you are here from The Needle and Thread Network, welcome! It's great to have you visit and I hope you'll stay for a while 😊 In the navigation bar just up there 👆 you can find links to my weekly devotions, my tutorials and my pattern shop, so feel free to explore. Sign up for my newsletter, too. On the 16th of each month, I send out The Bulletin, with links to new content here along with one of my favourite recipes and links to fun things to make. The concert itself was fantastic and I really hope to get to see them again someday. Maybe not when winter/spring weather will be able to interfere so much with our travel plans, though! The first thing I packed for our trip was my Sew Together Bag full of EPP supplies, of course. I had lots of stars and grey diamonds for my Scattered Stars quilt, but I didn't end up working on that at all. 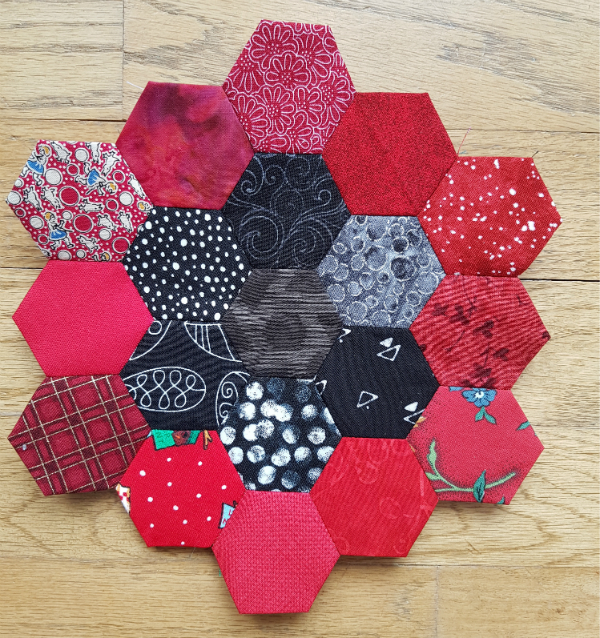 Instead, I basted a bunch of red hexies so I could start sewing together my Hexie Rainbow quilt. Because everyone needs two long term EPP projects on the go at once, right? 1661 1" hexies to make a throw size quilt. Whew! I have more basted, though. All of the red ones are basted for the next round, plus another 114, some in all of the other colours I need. Which still leaves me with almost 1500 left to go, lol! It's strange, but I definitely prefer working with hexagons rather than diamonds. I don't know what difference the shape makes, since I'm sewing along a straight side with either shape and the diamonds are no more difficult to work with than the hexagons. Weird, I know. I won't be giving up on my Scattered Stars quilt, though, as I really like where it's going, even if I didn't work on it this trip. If you do EPP, do you have a shape you prefer? Whatever you're working on, I hope you have a great weekend! * This post contains an affiliate link, which means that if you click the link and then make a purchase, I may receive a small commission. This does not affect the price you pay. 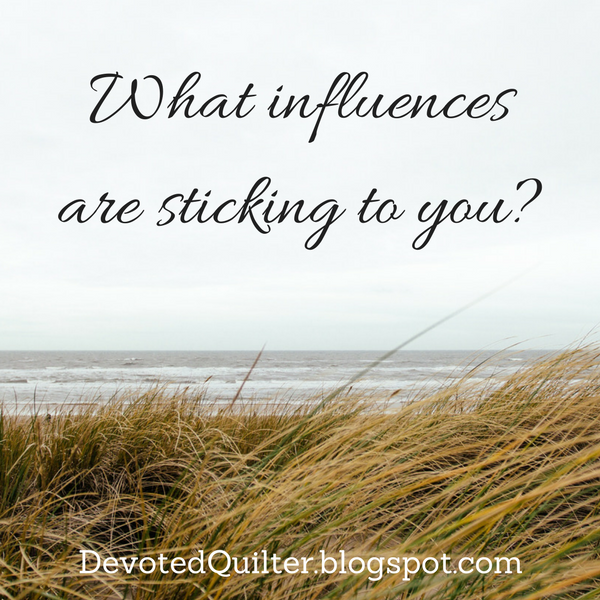 What is Sticking to You? 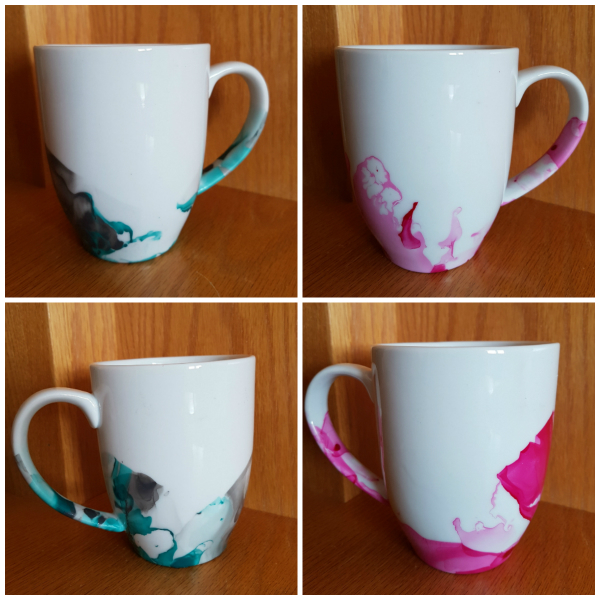 A couple of weeks ago, I led our church's women's group in a craft where we dipped plain white mugs into water with a coating of nail polish on the top. I made these two. You can watch the video tutorial I used here. It's pretty amazing how the nail polish sticks to the surface of the mug and changes its look. Dipping those mugs got me to thinking "what is sticking to you?" Obviously, I'm not thinking about the literal nail polish you may have sticking to your nails or the food colouring I sometimes have on my fingers 😊 I mean it figuratively - what sort of things are sticking to our minds and hearts? In 1 Corinthians 15:33 Paul wrote, "Do not be misled: “Bad company corrupts good character." Paul was writing about people who said there is no resurrection. He was warning the Corinthians to guard themselves against such 'bad company' because those errors and wrong thinking could rub off. This is probably one of the most famous Bible verses, known even to those who know nothing else about the Bible. It's used by parents to warn their kids not to associate with certain other kids, ones the parents feel would be a bad influence. I wonder if it was used that way even in Paul's day. The principle of it is pretty simple. Hang out with wise, moral people and you are more likely to become or continue to be a wise, moral person yourself. Hang out with foolish people, with those who steal or cheat or lie and you are more likely to eventually find yourself exhibiting those behaviors too. With Paul's use of it in relation to beliefs, we can understand how hanging out with those who believe the truth as shown in the Bible would be preferable to hanging out with those whose beliefs contradict it. Back in Paul's day, the company a person kept was pretty easy to keep track of. It was the actual people in your life, the ones you saw at home or work or around the community. While they probably couldn't always choose their company, at least it was obvious. Nowadays, though, things are a little more complex. Yes, we still physically keep company with people in our home, workplace and community, but we keep company with so many others too. Sometimes we don't even realize we are keeping company with people because they are not physically there with us. With us or not, though, we can certainly be influenced by the shows and movies we watch, by the books we read and by the people we follow on social media. What messages are sticking to us from those sources? Do those messages line up with what God says in His word? Are we allowing errors and wrong thinking to creep into our own beliefs? Are there ideas sticking to us that are completely contrary to how God wants us to live? Strangely enough, as I was thinking about this devotion, I couldn't get away from the thought that the company we keep also includes ourselves. Are there times when what we tell ourselves just doesn't line up with the truth? Times when we tell ourselves that God could never forgive us for ____, or that we shouldn't bother praying about something because it's too small to be worth His time, or too big for Him to fix? Times when we tell ourselves He can't really love us because we're too sinful/stupid or unworthy in some other way? Tell yourself those things often enough and they'll start to stick in your heart, regardless of the truth. Generally speaking, we can't see what is sticking to us very easily. We're just not good at that kind of self-awareness most of the time. Thankfully, there is a solution. David wrote, "Search me, God, and know my heart; test me and know my anxious thoughts. See if there is any offensive way in me, and lead me in the way everlasting" (Psalm 139:23,24). God knows everything about us, including the errors and wrong thinking we have taken on from others and the ones we've been telling ourselves. If we allow Him, He will show us those sticky things that need to be removed and the truths that should replace them.